I recently installed a 2-headed shower system in my master bathroom (2 shower heads coming from one pipe). Afterwards, the problem I suspected occurred. Having the "gate", if you will, set to direct all water flow to one head works great. However, if I try to make it so both outputs have a stream of water, the pressure in both is too low to be of much use. Is there any way I can increase the water pressure for this shower? All the other faucets and such are fine, so I'm not sure if increasing pressure to the entire house is what I am looking for. Excuse me if I used improper terminology, but hopefully this is understandable. You would need to increase the pipe size from the water supply (hot and cold) to the shower in question. A potential alternate solution/issue may be that some (most?) of the "gate" or "diverter" valves are not really giving full flow to either device when "set in the middle" - they are designed to go one way or the other, not both. A different one might offer less restriction in that mode; or something cobbled up from a Tee and two full-flow shutoff valves. This depends on what your current plumbing system looks like. If you have 3/4 inch copper coming into your house and 3/4" copper into the shower valve then yes you would have to upgrade your whole house - doubt this is it. If you have 3/4-1 inch copper coming into your house and 1/2" copper on the shower valve line then you would just have to upgrade that line. That might be easy or very very costly because sometimes you have to open up walls that you don't want to. 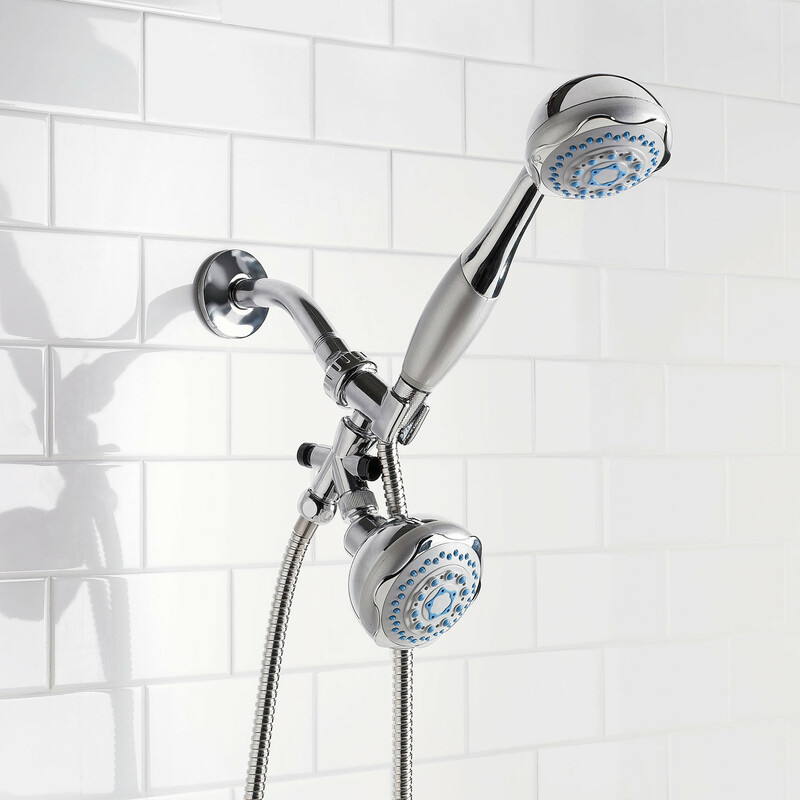 Whatever it is you need to figure out where the shower valve branch diverts from the main line. Then you can see if the branch is smaller or if it is easy or hard to get to. In a bathroom remodel, the shower valve I installed (with hot and cold inlets, tub outlet, shower outlet) had a small brass cone in the shower outlet, presumably as a restrictor. The lower tub outlet had no restrictor. If you have "full" pressure on your tub I suspect this is the case. If your shower has a large cartridge you might be able to remove it and feel if there's a restrictor, although removing said restrictor would probably be difficult from inside the valve. If you really wanted to remove the restrictor and had the skills you might be able to do it with only access to the valve from the tub side or by cutting an access panel from the back. The way I would do it is to remove the pipe feeding the shower from the valve, remove the restrictor with a drill or by pulling it out, then re-soldering the pipe back in place. Since the top of the pipe will be mounted to the stud you will probably have to cut a section of pipe then solder it back in place. Note that I haven't tried this, it's only a theory. Not the answer you're looking for? Browse other questions tagged shower water-pressure or ask your own question. Why do I have almost no water pressure after installing a new valve? How can I test and increase the water pressure in my apartment?